Derrick Platt’s legs buckled slightly when he tried to stick the landing following his celebratory post-match backflip. It was about the only thing the Yelm High School senior didn’t do perfectly at Mat Classic XXXI. Platt capped a flawless 38-0 season by capturing his second straight title at the Class 3A state wrestling championships at the Tacoma Dome February 15-16. A year after winning the 182-pound state title, Platt took home the 195-pound crown after beating Mercer Island senior Donn Howard, 2-1, in the finals. 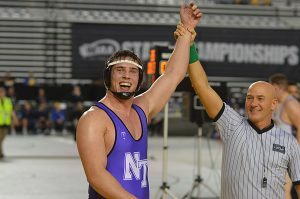 While Platt was celebrating title number two, North Thurston senior Kai Burgman (22-3) won his first state championship by defeating Rogers of Spokane’s Joshua Guzik, 2-1, in the 285-pound finals to give the Rams their first heavyweight state champion in 18 years. Platt dominated last year’s 182-pound finals, winning 7-1. His second title was significantly closer. After a scoreless first period, Howard, who defeated last year’s 170-pound champion Jacob Olson of Kamiakin in the semifinals (7-5), grabbed a 2-1 advantage with a reversal midway through the third period. Platt, however, was able to notch a reversal of his own 23 seconds later to reclaim the lead before holding on to make it back-to-back championships. Platt ran roughshod through the competition during the first three rounds of the tournament, winning all three of his matches by pin. Each victory came in under 2 minutes. He needed just 29 seconds to put away Rainier Beach’s Jacob Parmer in the second round and 67 seconds to dispatch Va Ili of Mountain View in the quarterfinals. Platt also breezed through his semifinal match, defeating Snohomish’s Ryan Douglas by technical fall (16-1) to secure his place in the finals for a second consecutive season. 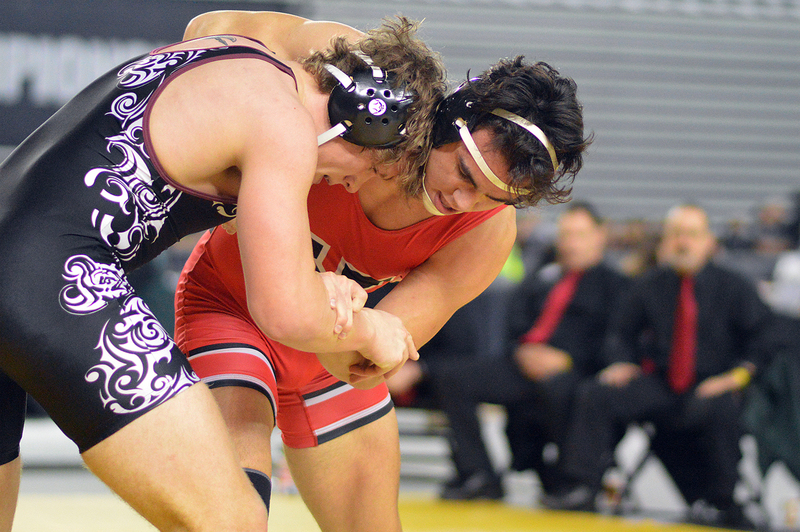 Platt was one of five Yelm wrestlers to advance to the semifinals. The Tornados also had sophomore Ryan Davis (126 pounds) and seniors Steven Reyes (138), Chayton Miller (152), and Jason Nelson (170) secure a place among the final four. Both Davis and Reyes finished fourth in their classification, while Miller and Nelson each posted sixth-place finishes. Yelm, which also received a seventh place at 113 from junior Jayden Hallman, finished third overall in the team standings with 151.5 total points. It marks the third consecutive year and 11th time over the last 12 years Yelm has posted a top 10 finish. It also represents the squad’s highest placing as a team since they were runner-ups in 2012. Mount Spokane posted 235.5 points to successfully defend its 3A state title. Bethel was second with 154 points. 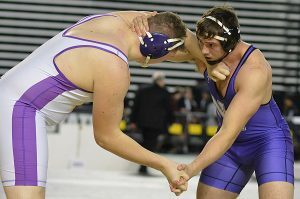 Burgman, who became the first North Thurston wrestler since Kyle Keeney in 2001 to win the state title in the heavyweight division, won his first two matches by pin before defeating Kelso’s McKinnie Franklin, 3-1, in overtime in the quarterfinals and Aram Gould of Cleveland (4-1) in the semifinals to punch his ticket to the finals. Timberline senior Diego Delgado rounded out the list of local state placers in the 3A tournament, finishing eighth at 138 pounds. Rochester’s Jayden Lancaster finished third in the 145-pound division in the 2A tournament. Lancaster defeated Tumwater’s Mason Burbidge (2:57) in the first round and River Ridge’s Kaden Rodriguez (3:23) in the second round before losing to Quincy’s Salvador Chavarin by pin (5:41) in the quarterfinals. Lancaster, who finished sixth at 145 last year as a sophomore, rallied, winning four straight matches in the consolation round, including a 6-4 triumph over Wyatt Schrader of Orting to claim third. Black Hills had four wrestlers place in 2A, highlighted by senior Tate Elliott’s fourth place in the heavyweight division. The Wolves also received a fifth from Nolan Keesee (138) and sixth-place finishes from Julian Kennedy (160) and Jordan Claridge (195) to finish 10th in the 2A team standings. Tumwater senior Caden Hicks became a three-time state placer after collecting a fourth at 220 and River Ridge’s Sammy Lile picked up an eighth-place medal at 120. Rainier registered its best team performances ever in the 1B/2B standings by securing eighth place as a team with 88 points. The Mountaineers got a fourth from Tyler Barlass (126), while teammates Jayson Ducey and Jacob Martin picked up sixth-place medals at 106 and 182 pounds, respectively.